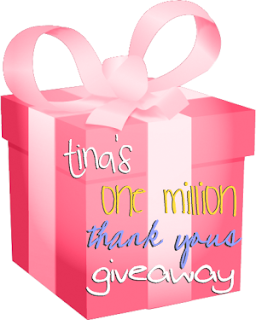 Miss Tina is proud for her readers reaching 1M hits on her site, therefore she would like us to own a fabulous gift and an opportunity to be on her page as well. There will be a weekly draw, thats why,everyone has a chance to win.So grab one and enjoy!!! Simply click HERE or the picture above to go there instantly!!! This thanks giving will run weekly until February 26, 2010.